It can be of great consequence to defeat creationism at selected battles, although not all fights should be fought and not all impostors enjoy “equal time” debating science under the illusion that a dialog between nonsense and facts will educate the public. But extraordinary circumstances do emerge: the draftsman of the Creation Museum, spiritualist Ken Ham, challenged Bill Nye, The Science Guy, to a duel. And Ham’s mistake was twofold, imagining that Bill Nye will not accept and, worse, organizing the clash at the preacher’s den, on February 4, 2014. Nye won the debate months in advance, perhaps years. His most recent and highly publicized advocacy for science literacy, awareness about climate change and support to education follow two decades of media exposure: from “The Science Guy” in the early 1990s, where elementary science was featured, to “The Eyes of Nye” in the mid 2000s, which questioned pseudoscience and educated viewers about addiction, antibiotics, nuclear waste, and cloning, to “100 Greatest Discoveries” and “The Greatest Inventions” for the Discovery Channel (both about technology and innovation), to “Stuff Happens” for Planet Green (pro-environment) and the latest “Solving For X” which highlights the value of algebra in children’s schooling. 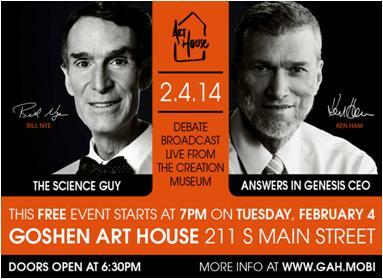 With enough credentials to describe himself as a “reasonable man” and “a patriot” concerned about the United States imminent drift toward “producing a generation of students who do not believe in science,” Nye began his opening debate-statement by thanking the organizers for the invitation to “this facility,” the Creation Museum in Petersburg, Kentucky. Indeed, proper science museums are accredited by reputable organizations (i.e. American Alliance of Museums; see 2013 List of Accredited Museums), but the enterprise envisioned by Ken Ham, president/CEO and founder of Answers in Genesis and the Creation Museum, aims at smuggling pseudoscience via the façade of an educational institution —two million visitors since 2007. The ultimate point in the debate was an old one, the ever-lasting conflict between science, represented by evolution, and supernatural causation epitomized by Biblical Creationism. In essence, an easy wrestling scuffle for science in today’s world —but not in the US, as pointed out by Nye, a unique nation in its opposition to evolution. Ham referred to the Old and New Testaments as “the book” —with which Bill Nye ought to be aware— containing “the evidence” for Origins, and for all beginnings, the universe, life, consciousness, morality; the list was long. Frightening! Nye took the path of explaining to Kentuckians how a cultural sense of scientific curiosity, innovation based on discovery, and love for exploring the realities of nature are the foundations of economic development and prosperity; the “things that matter” in a competitive world. “Mr. Ham, do you have a creation model that could help us predict something?” Of course, no answer, except for the recurrent reference to Genesis as the justification for empty arguments; however, the frustration resides not in the incoherent view of the cosmos by an individual who capriciously rejects facts, but on the impact that educational malpractice can have on students being encouraged to believe that the Earth is 6,000 years old, and that “because no one was there to witness evolution,” as portrayed by Ham, scripture suffices to explain the eons. Despite opposition to the debate by science celebrities and secular leaders, who ridiculed Bill Nye for lacking the “biology credentials” to confront an unpredictable, chaotic opponent in his turf, or for being “just an engineer with a Bachelors degree from Cornell (1977)” and holder of —almost meaningless for the critics— three honorary doctorates (Johns Hopkins University 2008, Goucher College 2000, Rensselaer Polytechnic 1999), or for not even resembling a “Navy-SEAL-Team-6-like-guy” toughened to take down a major target (yes, that contemptible was the blogging before the debate), The Science Guy overcame all significant resistance, and his persona and intellect prevailed. 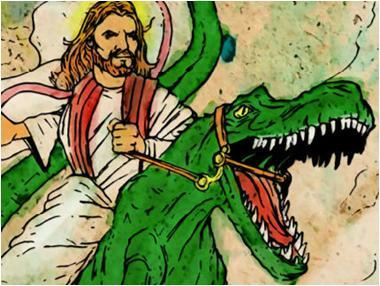 It took only a reasonable citizen, literate in science and evolution, with the courage to walk into the darkness of the Creation Museum, to illuminate the pervasive remnants of obscurantism. Judge for yourselves, the debate is available online (click here). Here are some statistics: 800 ticket-buyers in the audience, 70 media organizations, 10,000 churches, schools and colleges hosting a free-live stream (likely for Ham’s supporters), 750,000 viewers in YouTube within twenty four hours after the video was posted, and one of the top topics on Twitter. What was the major blow, if any? Well, 92% of 36,000 responders to a Christian Today poll declared Nye the winner. The big picture, however, is not the outcome of a debate, but that only 40% of Americans accept the reality of evolution. And not trusting science, in matters of science, can be suicidal in a world where our evolutionary background is the foundation of all our endeavors. — © 2014 by Guillermo Paz-y-Miño-C. all rights reserved. Scientific Article: Why People Do Not Accept Evolution?